Nowadays, the concept of power can illuminate the nature of contestation. Indeed, it is apparent that discourse coalitions exist both within the wind sector and the riparian corridors management. In the present study, a theoretical framework for policy power analysis is presented, while a balanced European and national energy policies represen-tation reveals the positive and negative impacts, towards which both the above two power sources may be attributed. The “power” holistic approach is mainly determined in a wider social-economic, political, and environmental framework. This multidimensional and holistic approach is considered invaluable for humans/consumers, in order them to determine their capacities, priorities and perspectives for viable use of power within the above complex-structured framework. Finally, the study adopts a balanced reassessment of the existing policies, offering tentative proposals for reducing conflicts. In the present complex socio-economic, political and environmental context of the mainly developed countries, the notion of power as source [1-3] and as discourse [4-25], plays a fundamental role in these societies development and prosperities. The main orientation of the above studies is concentrated on the involvement of alternative fuels-in the form of renewables-to sustain the conventional energy production grid. Among the available renewables, the present study is focusing on the energy production of wind farms. The negative impacts of wind farms operation could be grouped in the various determining parameters. Particularly, the wind turbines placing both to onshore and offshore land could cause visual intrusion. Visual intrusion impact is difficult to handle, since these wind turbines’ installation is commonly accompanying by noise production during turbine towers operation. Noise is soundly amplifying and causing annoyance to the nearby residential areas, even at very low levels of operating sound. The above setting of problems usually impacts on house prices at the regions of wind farms proximity. Moreover, preservation and conservation issues, in relation to potential impacts on wildlife and ecosystems can generate polarized opinions. Indicatively themes involve the wind turbine blades affecting birds’ migration routes, the shelter from wind for grazing animals, and the local ecosystems disturbance from the turbine towers. The revealing of the above disputes is preserved due to the common phenomenon that wind farms operation context of large international companies is funded by money overseas, with most of the equipment being of foreign origin. By this way, the benefits’ allocation towards big multinational businesses often causes resentment to the local communities. Furthermore, local interests are mainly expressing through the organization of local campaigns, and press media support; the latter could give emphasis to negative, critical or hostile approach. Misconceptions, misinformation and misrepresentation are the mainly responsible factors of the above tactics. Besides, the process of manufacturing the materials and equipment using fossil fuel sources is further results in indirect production of CO2. Finally, there are sometimes critical comments on location or inappropriate sitting of winds turbines’ installation, on behalf of press media or local authorities. On the other hand, the positive prosperities of wind farms operation include the wind turbines’ characteristics that are advantageous itself, since wind turbines typically generate around 80 times more power than that it was exploited in their construction and operation. Moreover these turbines have high energy payback times and efficient operation at lower or widely-fluctuated wind speeds. According to economies of scale, the necessary costs of wind farms construction is dramatically dropping, making the relevant projects economically viable. In the view of involving some form of advanced local control and local economic reinforcement, local impacts may be judged more favourable and/or underestimated. Particularly, the ownership and local economies’ strengthening potentials are favourably positioned against the sense of people’s powerlessness to protect their interests and their lifestyles. Additionally, waste land or old industrial site usage to wind farms construction could increase the status of former abandoned or disreputable areas. Besides, measures that are supportive to local communities include employment during construction, rental income for local farmers for wind farm development, possible tourists attraction, less charge for electricity to those who live near the farms, and a small surcharge that consumers can donate directly to a fund or trust investing in specific local renewable energy projects. The above activities are apparently supporting and revealing a more direct sense of local involvement. The determining systems of water rights are the riparian rights, the public allocation, and prior or historical rights. 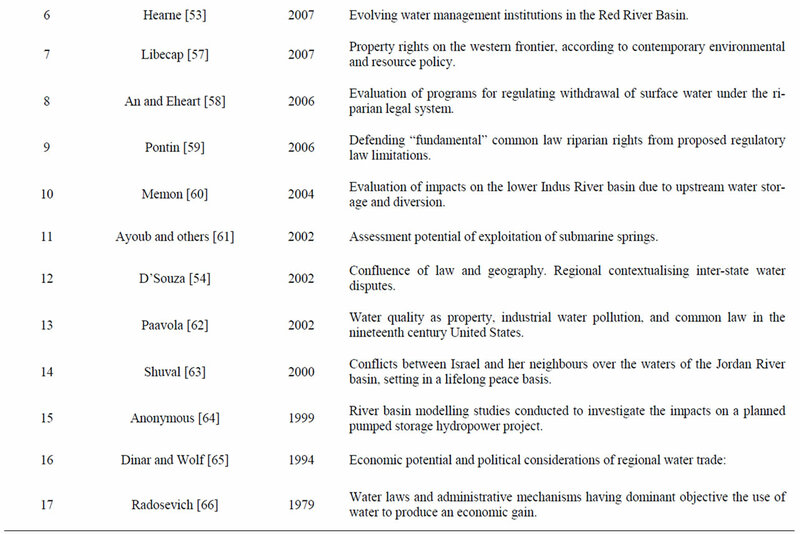 The context of power in riparian rights is mainly expressed in the significant advantage of upstream states to control the source of river, over the downstream riparian states. Parameters that are expressing the influential role of each counterpart country/state/region include the involving states’ allege for historical rights to own and control water passing though their border. Therefore, the demand for the “shared” water resource is increasing. Furthermore, upstream states are mainly mountainous, having heavy winters, dry summers, and extremes in river flow, while downstream states have dry climate and are highly depending on the river water, having no alternative sources; thus each state stores water by filling up its reservoir. Finally, the context of powerlessness is twofold, firstly, the difficulty facing the states to share the resources fairly, since mostly there is not enough water in the system to meet all their demands, and, secondly, some uncertainties’ existence, which is associated with climate change and affect the volume of water in the rivers, through guaranteed forecasts. Wind power generates not just electricity, but also strong argumentative views among represen-tatives of public and private organizations of the developed countries. Therefore, it is noteworthy determining the coalitions and conflicts that have developed in relation to wind power. Particularly, a current discourse from energy companies, international NGOs and central governments is pointing out the role of renewables, mainly wind, in confronting climate change. Besides, nature conservation organizations express the need to balance immediate disruptions to sensitive ecosystems against long-term sustainability issues. Nevertheless, local residents’ groups’ opposition has increased as planning applications for wind farms are flourishing. In the relevant literature  numerous types of environmental discourse are identifying, regarding to global limits, to ‘business as usual’ problem solution, to the sustainability transition, and to express green radicalism. This analysis is largely concerned the macro-level of discourse content, with few examples of actor behaviour. Furthermore, in the case of environmental planning casestudies, a set out a three-part discourse typology is also co-evaluated, since it comprised of scientific rationality, economic rationality, and communicative rationality. The first two typologies are developed within bodies of technical expertise, whilst the third is ‘a politico-legal discourse based on a philosophy of rights’ involving contemporary debates on the conduct of democracy and the scope for citizen choice . • security of supply of traditional fuels concern is stemming from firstly political instability in producing regions and secondly signs that oil and gas prices are escalating under conditions of accelerating depletion. The first two arguments are valued as scientifically rational since ‘environmentally benign’ and locally available renewables are being promoted to substitute/complement traditional fuels. Additionally, the ethical–normative discourse is also considered in notions such as the ‘polluter pays’ principle. The third argument stems from the discourse of ‘economic rationality’ incorporating the concern with the supply and demand equation following by implicit acknowledgement of the ‘resource limits’ thesis . The general interest is focusing on the first argument, because of the success of climate change discourse, with its insistence on anthropogenic emissions as the catalyst of a runaway greenhouse effect. This discourse coalition aligns the UN (as evidenced at Rio and Kyoto), national governments and NGOs. ‘Global warming’ alert by the media from the late 1980s created a ground-swell of public opinion favourable to reactive policy measures. These measures are supplementary to the adopted governmental policies of mitigation over adaptation, emphasizing the slowing of climate change over anticipating ways to live with its consequences. Nevertheless, scientific explanations of climate change credibility remains questionable, since they offer only rough indications as to the prevailing technologies and policies for mitigation purposes. This indeterminacy is prerequisite of offering opportunities for other influential discourses for wind power . From the above analysis it is relatively novel the polarization between wind and anti-wind campaigners within the energy sector of the same discourses; namely scientific arguments related to climate change and economic arguments related to technology choice. Because these source arguments are unable to settle the debate, the polarization of interests has been overlaid with an ethical-normative frame that translates multi-layered decision-making into simplistic moral charges. Wind lobbyists allege that climate change is unwelcome, wind power helps prevent climate change, therefore its promotion is morally responsible and altruistic (being benefited by the greater number) whilst resistance is considered reprehensible and selfish (being motivated by individual interest and ‘NIMBYism’). Furthermore, placing responsibility to rural communities for reliance on polluting technologies is particularly questionable. Indeed, on the one hand, traditional energy sources meet society-wide needs whilst, on the other, the energy companies who run wind farms often own fossil fuel or nuclear installations, meaning primary responsibility under the ‘polluter pays’ principle lies with them. In this context, anti-wind campaigners are outraged by the accusation that they lack moral fibre, and return the compliment by charges of corruption, profiteering, illegal construction and operation . The present study aims at revealing the fundamental role of the three dimensions-environmental sustainability, economic rationality, and social sustainability-as closely related to the three rationalities that have been examined in terms of their individual legitimatization of environmental planning. The level of these dimensions’ interaction is succinctly presented in the following Tables 1-2, where the existing references’ presentation is expanded within the latest three decades, according to author surnames’ alphabetical list. The riparian zone is considered as a dynamic system with constant interaction among the local environmental, the biological and the aquatic species and processes. Indicative anthropogenic and natural modifications that could affect the riparian zones-or even completely replace the existing riparian buffer zones and corridors  with other phytoplankton and zooplankton species-are the cutting trees and the riparian channel obstruction by debris (branches and leaves) after the harvest. Additionally, logging operations can produce increases of sand and silt in the streambed and this is more significant in small streams . In the relevant literature  it is shown the main associations between aquatic plants and river channel characteristics by identifying typical groupings of aquatic plants of different morphology within British rivers. An exploratory analysis of the degree to which morphological plant groupings reflect channel physical characteristics was conducted exploring how these plant groupings and physical characteristics map onto potential river styles as indicated by established relationships between bankfull discharge, channel slope, and sediment calibre . • Properties of the physical environment that vary markedly along the river continuum: site elevation above sea level, valley gradient, the median annual flood, and bank full channel width. • Properties of river energy and sediment size that characterize particular river sites: unit stream power (USP) or stream power per unit channel width, mean bed sediment size, percentage bed cover of silt and finer particles. • The abundance of five plant morphological groups (9-point scale): mosses, submerged linear macrophytes, submerged patch-forming macrophytes, linear emergent macrophytes, branched emergent macrophytes. Placing the riparian rights in a wider socio-economic context it is apparent that the main contri-bution of riparian rights is its determination of water law and the ongoing institutional evolution of local water management. Indeed, in the relevant literature it is observed that the same River Basin abides to three completely different sets of water law; based upon riparian rights, based upon prior appropriation, and based upon provincial control . Table 1. 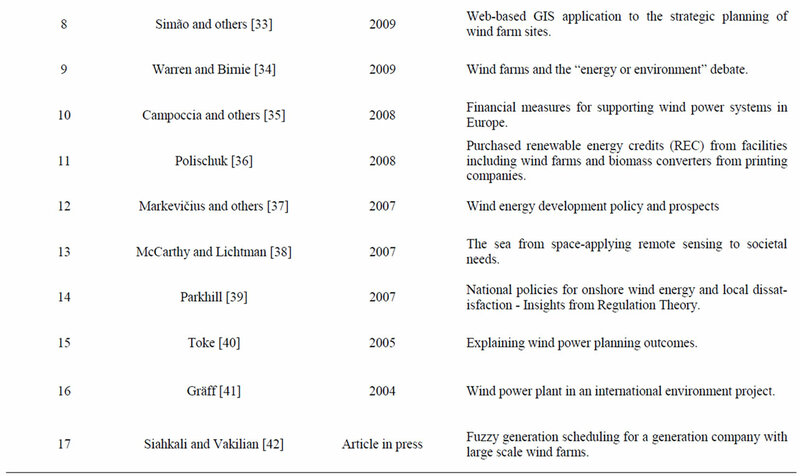 Wind farms in the context of social and environmental sustainability. Table 2. 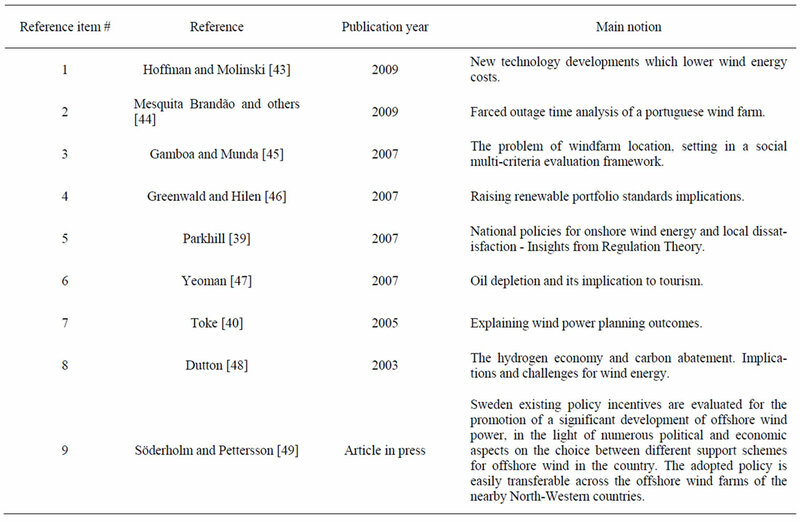 Wind farms in the context of power notion, political initiatives and economic rationality. purpose, including recreation and wildlife habitat. Currently, the definition of public waters also includes wetlands, which provide significant wildlife habitat. Moreover, in cases where the state declared private wetlands, which were potentially convertible to valuable cropland, to be public waters, a fund was established to compensate landowners for this “taking” of property rights . Besides the above referred Water Law, the role of local agencies is essential to monitoring the water management implementation . Particularly, a number of institutional arrangements have been made in Minnesota to facilitate economies of scale and allow for water management in areas larger than a county. The establishment of joint power organizations-including the Soil and Water Conservation Districts (SWCDs)-provide a mechanism to employ specialized engineers and technicians to work over a wide area to provide technical assistance to landowners for soil and water conservation practices. Although local resource boards are generally drawn along county lines, North Dakota law does allow for multi-jurisdictional Joint Water Resource Boards to be formed along watershed lines and provide planning and programs for watershed areas . On the other hand, it is also argued that with the Industrial revolution, multiple uses of water, urbanisation and related social developments, the doctrine of riparian rights proved inadequate for developing a legal regime required for commoditisation of water. Therefore, an emphasis on the ‘private’ could restrain multiple water uses beyond the basin of origin by keeping the water tied to land rights. An emphasis on the ‘public’ through licensing and regulation meant the State remained the regulator of water in place of market-mechanisms . An overview regarding water policies implementation in worldwide level of analysis showed that the ground for further developments in the legal and institutional conditions for commoditisation of water shifted to the United States. In this situation, the relative autonomy from European social history and large arid tracts that required different approaches to water management made legal innovation possible. Here the doctrine of ‘prior appropriation’ emerged as an influential idea. Complying to the prior appropriation doctrine the state regulated water allocation on the basis of prior use. Such a doctrine proved inflexible as it froze water use in time in the same way as riparian rights froze water use in place . Table 3. Power notion and riparian rights in the context of environmental sustainability, economic rationality, and social sustainability. its wake new legal and institutional innovations in relation to water . Under Crown rule irrigation was regulated through statutes such as the Northern Indian Canal and Drainage Act, 1873. Such irrigation statutes regulated the construction of canals, drainage channels, and irrigation works, and the distribution of water and levy of charges for works as well as water. The nature of rights over water remained ambivalent. Neither riparian right doctrines nor prior appropriation doctrines worked in favour of a colonial state. Under the Indian Easement Act, 1882, the state through public law created private easement rights over water but at the same time exempted any prescriptive claims against the state. Regulation of waters of rivers and streams were neither communitarian as in traditional laws, nor proprietary as in European law. They were quite simply colonial . 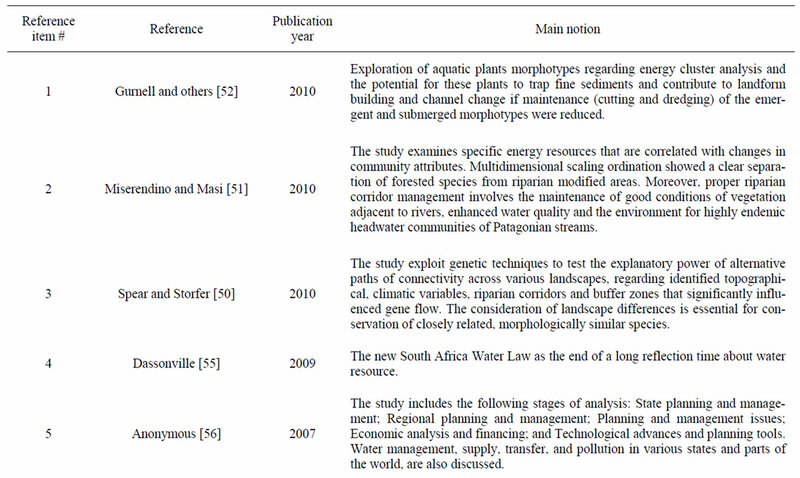 The fundamental interactive role of the three dimensions-environmental sustainability, economic rationality, and social sustainability-as closely related to the riparian rights context is succinctly presented in the following Table 3, where the existing references’ presentation is expanded within the latest three decades, according to author surnames’ alphabetical list. Both the two examined typical types of power resource and power discourse, wind farms and riparian rights respectively, are profoundly involving economic and noneconomic, social and environmental, managerial and non-managerial, qualitative and quantitative criteria of investigation. In an attempt to interpret and evaluate the above references presentation, it should be inferred that a distinct trait of wind farms is the existence of both geo-morphological and spatial criteria of their implementation. According to the preceding analysis, the main attributes of European and national policies regarding the power discourse involve the necessity of greater recognition regarding the range of actors involved in sustainability debates; besides the need for closer inspection of the technological alternatives and policy instruments, to bring in a broad spread of options as regards greater energy efficiency and the diversification of energy sourcing. Power discourse implementation is also perquisite the re-evaluation of the role of communicative rationality over and against simplistic ethical-normative discourse. Regarding the energy debate of wind farms incorporation the conventional energy production grid, specific clarifycation of the issues arising is desirable; notably a clear differentiation between actual cuts in GHG emissions (occurring when fossil fuel combustion is reduced), and notional avoidance (which is achieved by simply adding wind capacity to current generation systems). The necessity for more information and transparency regarding “actual cuts” and “notional avoidance” allows balanced and objective assessments, but this in turn implies longer time frames for consultation and reflection . On the other hand, riparian rights are especially involving legislative and techno-economic criteria of their implementation; the latter criteria are also considered in conjunction to upstream water storage and diversion, as well as to planned pumped storage hydropower projects. As it has been also reported , state agencies have (or should be) evolved to implement the water quality provisions of the national water law legislations. Joint powers agreements could provide a framework to allow for smaller local organizations to collaborate with other organizations on issues of mutual importance. Additionally, new roles could be stipulated for conservation districts and other local water management planning agencies . In considering discourse coalitions related to power as source (wind farms) and discourse (riparian rights), the present study has pointed to the main European and national policies of power exploration in a contemporary socio-economic and environmental framework. The analysis reveals the stalemate that pertains when rival coalitions lay claim to similar environmentalist arguments, but directed to different outcomes. The reassessment of the uses to which those arguments are put thus opening tentative proposals for reducing conflicts, is also denoted. Finally, the adopted multidimensional approach is promising to successfully rationale existing or predict future human consideration of power, within a contemporary complex socioeconomic framework. C. Cushion and R. L. Jones, “Power, Discourse, and Symbolic Violence in Professional Youth Soccer: The Case of Albion Football Club,” Sociology of Sport Journal, Vol. 23, No. 2, 2006, pp. 142-161. R. Baločkaite and L. Rinkevičius, “Nuclear Power Discourse in Lithuanian Mass Media and Public Opinion: Attitudinal Divergencies and the Emerging Talking and Acting Classes in the Risk Society,” Filosofija, Sociologija, Vol. 20, No. 4, 2009, pp. 259-270. R. Fox and J. Fox, “Power-Discourse Relationship in a Croatian Higher Education Setting,” Education Policy Analysis Archives, Vol. 10, No. 5, 2002. V. Sewpaul, “Power, Discourse and Ideology: Challenging Essentialist Notions of Race and Identity in Institutions of Higher Learning in South Africa,” Social Work, Vol. 43, No. 1, 2007, pp. 16-27. X. Lin and C. Fang, “Study on the Non-Coal High-Energy-Consumption Chlor-Alkali Industry Layout in China Based on the Development of the Non-Grid-Connected Wind Power Industry,” 2009 World Non-Grid-Connected Wind Power and Energy Conference (WNWEC 2009), pp. 501-506. A. Campoccia, L. Dusonchet, E. Telaretti and G. Zizzo, “Financial Measures for Supporting Wind Power Systems in Europe: A Comparison between Green Tags and Feed’in Tariffs,” 2008-International Symposium on Power Electronics, Electrical Drives, Automation and Motion (SPEEDAM), 2008, pp.1149-1154. T. Polischuk, “Cradle to Cradle,” Package Printing, Vol. 55, No. 1, 2008, pp. 30-34. J. E. Gräff, “Wind Power Plant in an International Environment Project Management in an International Wind Farm Project,” VDI Berichte, 2004, pp. 147-164. D. L. Hoffman and T. S. Molinski, “How New Technology Developments will Lower Wind Energy Costs,” 2009 CIGRE/IEEE PES Joint Symposium Integration of WideScale Renewable Resources into the Power Delivery System (CIGRE/PES 2009), Article Number 5211217. R. F. Mesquita Brandão, J. A. Beleza Carvalho and F. P. Maciel Barbosa, “Farced Outage Time Analysis of a Portuguese Wind Farm,” Proceedings of the 44th International Universities Power Engineering Conference, (UPEC 2009), Category Number CFP09569, Article Number 5429528. S. F. Greenwald and C. A. Hilen “Why Raising Renewable Portfolio Standards won’t Work,” Power, Vol. 151, No. 3, 2007. P. Söderholm and M. Pettersson “Offshore Wind Power Policy and Planning in Sweden,” Energy Policy, Article in Press. G. Dassonville, “The New South African Water Law: Ten Years Later,” Techniques-Sciences-Methodes, No. 5, 2009, pp. 53-59. B. Pontin, “Defending ‘Fundamental’ Common Law Riparian Rights from Proposed Regulatory Law Limitations: Lessons from Parliamentary History,” Journal of Water Law, Vol. 17, No. 1, 2006, pp. 3-13. A. A. Memon, “Evaluation of Impacts on the Lower Indus River Basin due to Upstream Water Storage and Diversion,” Proceedings of the 2004 World Water and Environmetal Resources Congress: Critical Transitions in Water and Environmetal Resources Management, 2004, pp. 3735-3744.